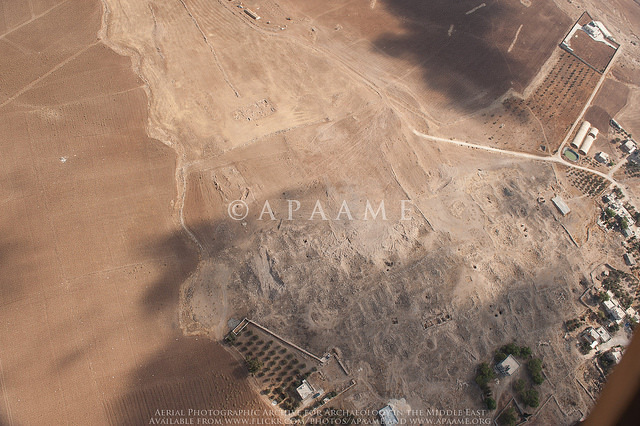 Masuh is a rarity – a large Roman village in the hinterland of Philadelphia (Amman) which was not overlain 50-100 years ago by one of the scores of modern villages that grew up on the ruins of the past. One of the earliest aerial photographs of the site – taken by the German Air Force in 1918, shows the buried remains in isolation except for dozens of beduin tents nearby. A vertical photograph of 1953 still shows no buildings at the site. By 1998 there were several houses and gardens eating into the ruins and chance finds had resulted in the excavation of two churches with splendid mosaics. Damage has continued ever since and can be traced through successive Google Earth Images (from 2004) and APAAME’s own frequent aerial photographs (from 2009). The results are alarming. 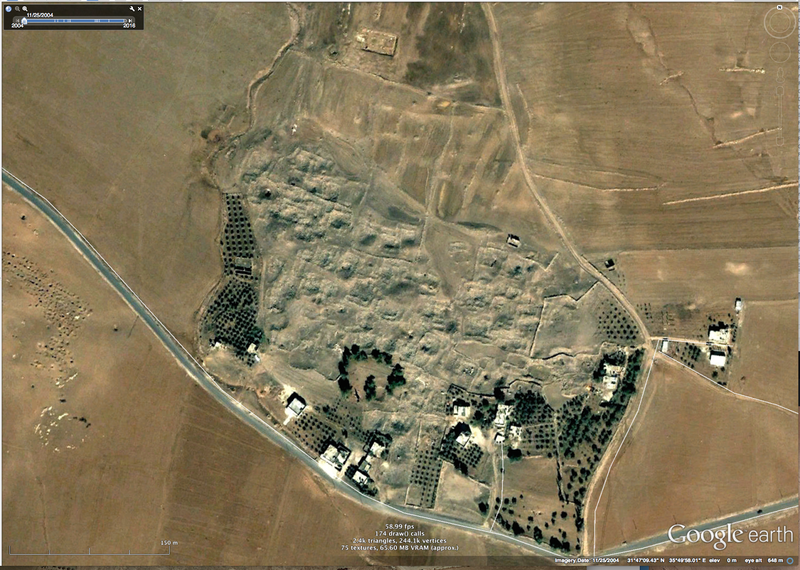 As the two Google Earth images show, between 2004 (Fig. 1) and 2016 (Fig. 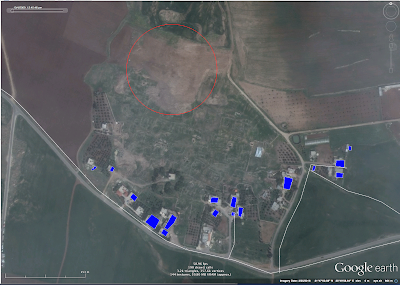 2) most of the houses visible at the earlier date (blue on Fig. 2) had been extended and many new houses added. The most recent aerial photograph (taken on 28th September 2016) shows (Fig. 3) that even the clearance that had already taken place on the northern edge between the church (top left) and the beginning of the village itself (red circle) has had the further attention of a bulldozer which is eating into the area of buried housing. 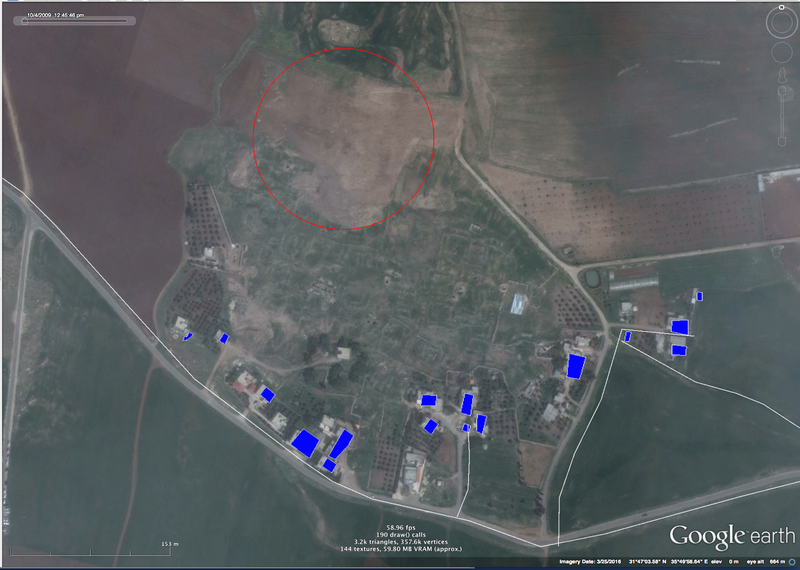 Beyond the area of the village itself, our monitoring has revealed similar destruction of cemeteries – discovered and looted and being destroyed, and external structures damaged. It is not too fanciful to say that this important survivor may be largely gone in a further decade as population pressure in the vicinity of Amman continues to grow. Fig. 1. Google Earth image of Masuh on 25 January 2004. Compare the location, number and extent of houses with the most recent image. Fig. 2. Google Earth image of Masuh on 25 March 2016.